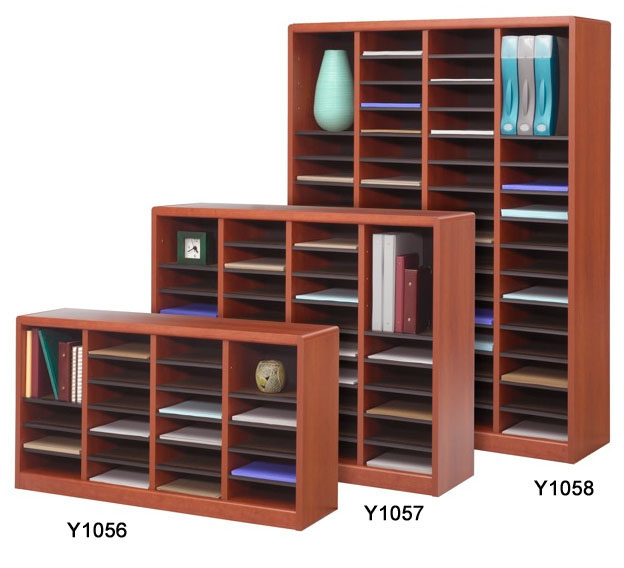 Softly rounded, radius edge corner design for front-office good looks. 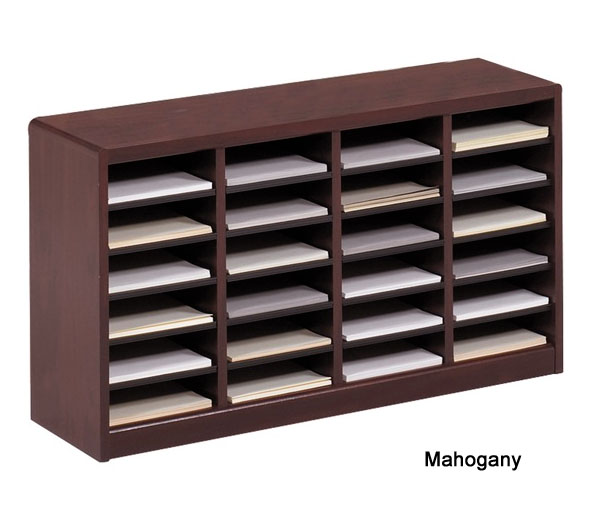 For use as a table or counter-top organizer, a mail sorter, or high-density literature organizer. Solid 3/4" wood product core construction. Standard letter-size openings are 9"W x 11"D x 3"H. Shelf weight capacity is 10 lbs per shelf! Removable hardboard shelves with label holder molding. 24 Compartment Literature organizer sold above. Other sizes sold below. 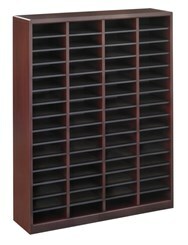 Measures 40"W x 11-3/4"D x 23"H overall. Choice of two laminate colors, Cherry or Mahogany. Shipped unassembled. Shpg. weight 70 lbs. PRICE INCLUDES SHIPPING! Please allow 1-2 weeks for delivery. 1 - 2 $389.00 ea. 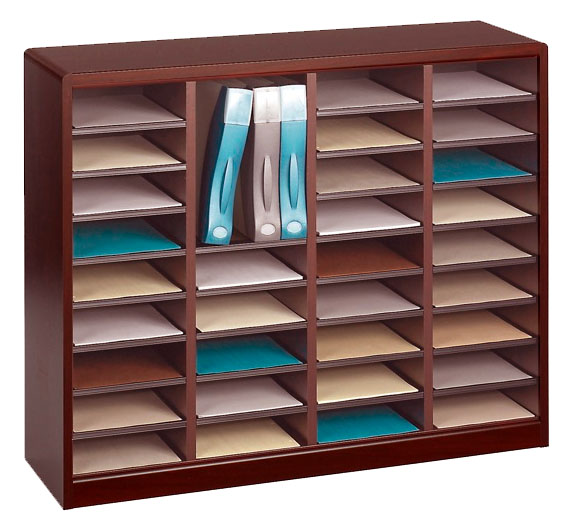 36 compartments measure 9"W x 11"D x 3"H each. Solid 3/4" wood product core construction with laminate finish. Removable hardboard shelves with label holder molding. 10 lbs weight capacity per shelf. 40"W x 11-3/4"D x 32"H overall. Shipped unassembled. Shpg. wt. 90 lbs. PRICE INCLUDES SHIPPING! 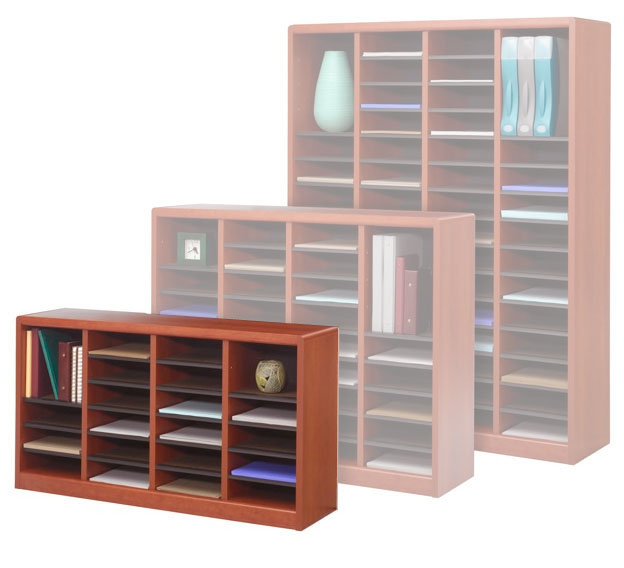 Solid 3/4" wood product core construction with laminate finish.60 compartments total. Compartments measure 9"W x 11"D x 3"H each. Removable hardboard shelves with label holder molding. 10 lbs weight capacity per shelf. 40"W x 11-3/4"D x 52-1/4"H overall Ships unassembled. Shpg. wt. 135 lbs. PRICE INCLUDES SHIPPING!